A hard, dust free uniform calcium nitrate granule developed for broadcast application. After application the granule dissolves easily for rapid plant uptake. NitroCal-Ag is ideally suited to supply the nutritional requirements of vegetables, fruits, vines, flowers, turf and ornamentals. Nitrogen is present as nitrate. The readily available nitrate-nitrogen gives an immediate and predictable growth response. Calcium is essential in the development of all plant tissues and adequate supply and uptake ensures longer shelf life in all horticultural crops. Calcium helps to prevent plant disorders such as bitter pit in apples, blossom end rot in tomatoes and capsicums, hollow heart in Brassicas, and reduce incidence of tip burn in lettuce crops. While nitrate nitrogen is available in all temperatures and unlike urea and ammonium based fertilisers, cannot be lose to the atmosphere. 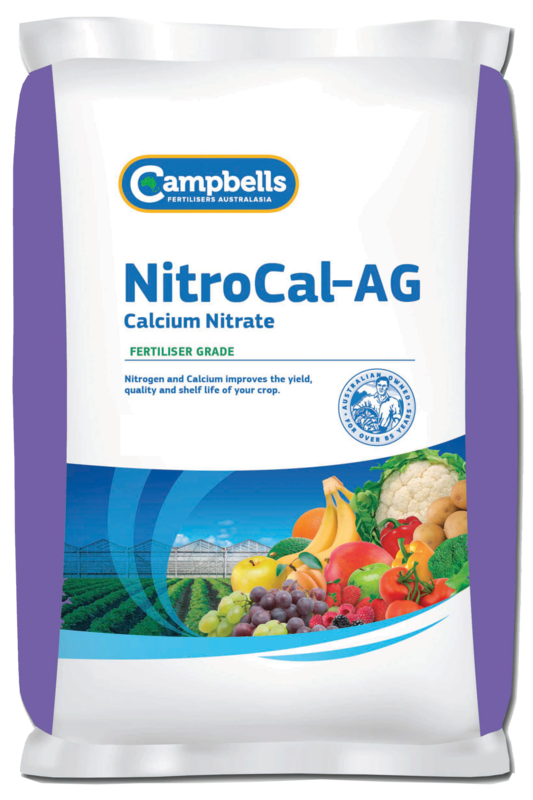 Campbells NitroCal-Ag can be the major nitrogen source in a fertiliser program or strategically used at specific times in the development of crops, in conjunction with other fertilisers. NitroCal-Ag is developed for broadcast or top dressing application. It is a non-dusting, free flowing product that can be applied as a band or broadcast. General rates for horticultural crops are between 100-200 kg/ha in a single application. The actual rates, number of applications and their timing will vary considerably for different crops and for different districts. Before application, seek advice from your Campbell’s NitroCal-Ag distributor or your local agronomist.